In the world of angling and fish finding, fish finder is a household word. They are used by fisher on boats to locate fish and make better catches in aquatic environments. When the time comes for most anglers to choose a fish finder, there is often confusion as to which is which, and which has the better features that would make fishing a much better, simpler and rewarding experience. This guide is meant to walk you through the process of getting to know these seemingly tracking devices, their models and offing features. Before we begin with the detailed guide, have a look at my picks of the best side scan imaging fish finders on the market. What is Side Imaging All About? 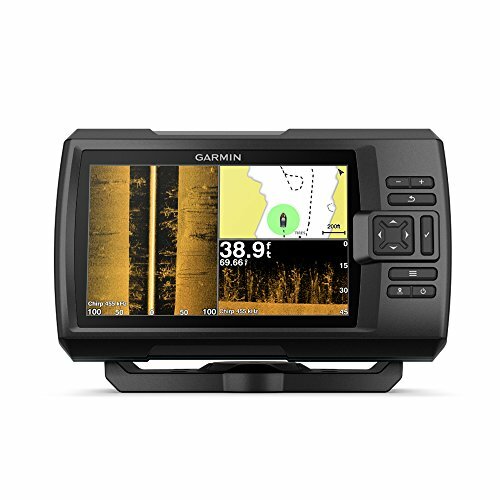 This is one of the most recent units released by the Garmin at the outset of 2018. 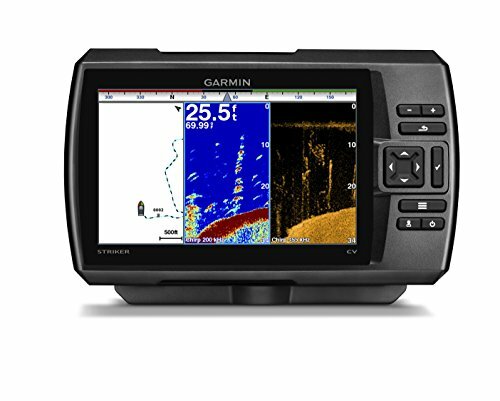 Differing from its predecessor, the Garmin Striker 7SV when it comes to sonar features, it has a display of 7.0” diagonal, 800H x 480V pixel resolution, WVGA color, and backlight. Its sonar is made with a High Wide Traditional CHIRP, CHIRP ClearVu, and CHIRP SideVu. Its frequency and coverage pack a 2D sonar High Wide CHIRP punch. A CV52HW-TM (12-pin) transducer, a power output of 500 watts (RMS), an internal and high-precision GPS and waypoints of 5,000. 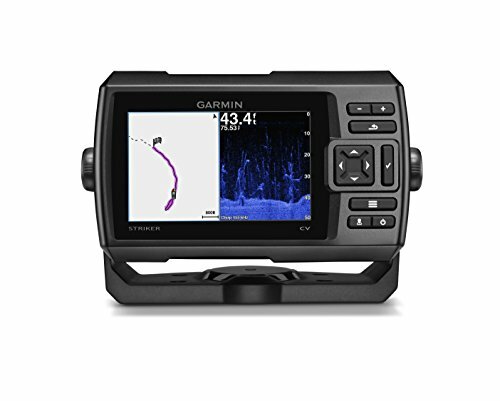 This fish finder has three sonar types’ the traditional 2D sonar, ClearVu and SideVu, using the CHIRP technology for all three, and this comes with several merits. First off, it provides a much better separation between targets, making it easier to differentiate between fish targets and vegetation or structure. As well, sonar images, be them 2D or CV/SV, possess much less clutter. In contradiction to the former DownVu technology, ClearVu gives a significantly wider imaging and a general better view of the bottom and underwater habitat. Should you be wondering, this unit of Striker is not built to be compatible with Panoptix transducers, nor does it have the Panoptix sonar technology. As for the sonar beam coverage, its traditional sonar system uses a conical beam with coverage of 24 to 16 degrees. This version was released in November 2013 as a new series of fish finders. The unit is highly innovated equipment that features a brilliant wide, 480 x 800 resolution displays that show 256-colors on a 5-inch screen complete with some backlit feature which ensures clearer and crisper images in all kind of lighting conditions, both during the day and at night. Taking a lot of the display space, its illuminate digits provide information on the temperature of the water, depth and vessel speed. On the other hand, the Helix 5 SI GPs is actually a scaled-down version of the 7-inched 899 model, differing only in size of display. The internal GPS is slightly enhanced, providing more accurate position readings when compared to existing models. This Helix unit features a preloaded UniMap cartography and micro SD slot for additional map software or to pinpoint possible waypoints. With its 2D sonar, the unit is able to penetrate 1500 feet down by dishing out 200 kHz waves in 20-degree cone-shaped angle. 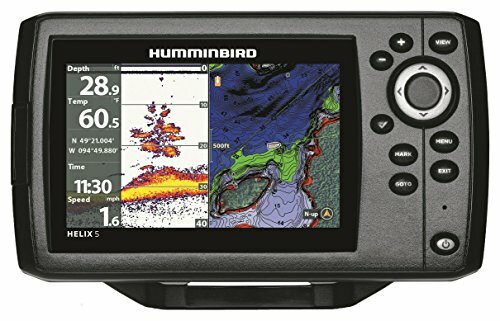 When Hummingbird first released the Helix 5, many anglers were surprised to see a side and down imaging fish finder at a price below $500. Years before, fish finders with such dual features used to cost well above $1000. This unit has a 5-inch display, a resolution of 800 x 480 pixels and a 16-bit color TFT. Nearly all the models that are GPS-enabled have been upgraded with CHIRP 2D sonar and CHIRP imaging. This unit has a sonar which can cover a range of frequencies, instead of just one; a technique that helps create a much better clearness and separation between target and structures. Additionally, the unit has improved in the Keypad UI as snapshots can now be saved using a long hold press of the Mark button. A short press will just lay down a waypoint. For sonar units and imaging, the check-mark button toggles frequency, and the zoom keys, which are represented as ¬¬+ and –, control the device’s sensitivity. This enhancement, coupled with those as mentioned above makes it very convenient and a big time-saver on the water. Even more, the new Helix 5 GPS 2 can live-map with AutoChart Live; a capability that can be unlocked when the software is upgraded. This is one of the best depth finders to emerge in the Helix series, since its release few years ago. Though the model is not exactly new, it benefits from a good number of positive feedbacks. It has in its offing three sonar types including DualBeam Plus, Side Imaging, and Down Imaging. Additionally, there is an accurate GPS system, in-depth coloring LCD with user friendly RE-Flex Menu system along with Hadis DI and SI feature. 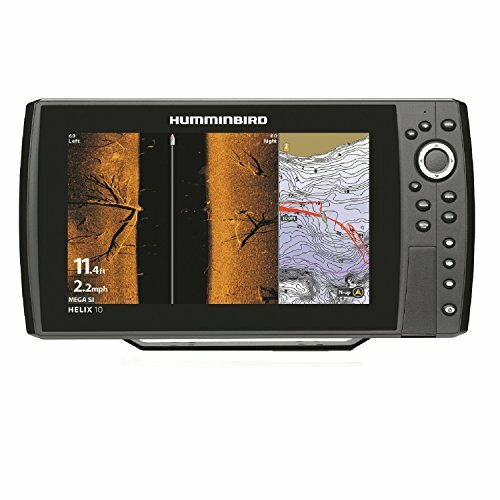 The fish finder unit has a whopping 10-inch diagonal screen high-quality color lcd screen, an 800H x 480V pixel resolution, and a backlight. Regarding its depth capability, the DualBeam Plus reaches whopping 1500 feet, and the side and down imaging can both reach 100 feet. As for its frequency and coverage, the details are DualBeam Plus: 200 kHz/20 degrees and 83 kHz/60 degrees. DI is 455 kHz/60 degrees, and SI is 455 kHz/86 degrees. In the unit is a transom transducer packing an XNT 9SI 180 T feature. Its power output is 500 Watts, and power input is 10.8-20 VDC. With a sonar recording feature, the fish finder allows you to record feeds in order to review them later. Recently, the Garmin Company rebranded their DownVu sonar technology, which is now known as ClearVu. According to the company, this newest model has a slightly wider imaging than the former DownVu. Additionally, the GT20-TM transducer is replaced by the CV20-TM, which appears somewhat bigger. In sonar terms, this unit offers two technologies; the 2D CHIRP and the ClearVu. The standard version is best used in finding fish targets of if Fish ID, alarms or flasher mode are functions you fancy to use. ClearVu is conversely the best to use for the observation of structure or the bottom contour because it accords you the possibility to better understand the shapes. This sonar unit is only capable of using 77/220 kHz frequencies fir 2D and 455/800 kHz for ClearVu, with the added CV20-TM. This means that with the included transducer, the unit can use Mid-Range CHIRP for its standard sonar. Better still, the transducer can incorporate a water temperature sensor; at this moment, being a unit that can indicate the temperature of the top-layer water. It has a 7.0” diagonal screen, 800H x 480V pixel resolution, WVGA color and a backlight. Its depth capability reaches 1,750 feet of freshwater and 830 feet in saltwater habitats. Sonar technology has become the mainstay in some aspects of the digital world. When it comes to that, side imaging happens to be among the list of the most advanced sonar features that a fish finder can possess. The reason is, having such a feature you can obtain a more detailed pictorial display of the beneath and locate a lot more fishes than the rudimentary sonar. Nevertheless, should you have never had a fish finder before, and looking to add one to your fishing arsenal, it is likely that the varieties in the marketing can be overwhelming for you. The multitude of features packed with sets of advanced fish finders would definitely pose a colossal problem for you. Added to that complication is trying to understand how SI technology works and knowing exactly what it can do for you. This is a very important aspect of purchasing a depth fish finder, and having all this knowledge will help you make the right choice. Side imaging sonars, also referred to as side-scan sonars, are a set of sonar system that was developed to create an image of large areas on the seafloor effectively. This sonar device emits conical or fan-shaped pulses down towards the bottom of the sea, across an extensive range perpendicular to the path the sensor follows through the water. An average fish finder with Side-Imaging comes with a unique type of transducer, which is conventionally mounted on the outside of the transom of the boat. Using two sonar beams with one on each side of the boat, the main objective is to aim them in the perfect angle from the boat, typically covering up to 300 feet of water on each side, depending on the unit. Most anglers, especially beginners, will want to know the upsides of a particular fish finder before settling for it. This is because, in the art of ice fish finding, there are a lot of considerations and factors at potent play, and if you end up with the wrong fish finder, the chances of finding and catching impressive shoals of fish will be very slim- if at all there will be any. As far as this guide is concerned, the side-scan imaging fishfinder should be the best option for you due to a lot of reasons. Not to decide for you, but to point you in the right direction, these are the offing benefits of the SI sonar technology. First off, a sonar of this kind has the ability to point out a lot more fish than any traditional sonar fish finder.Should you be in possession of a split-screen fish finder and conduct a scan of a given area, while observing both side view and conventional sonar view on that screen, it will be easy for you to notice that a lot of fish detected by the side imaging will not be displayed on the standard sonar. Secondly, being that SI models scan the water side-to-side of the boat, it will be able to allow you to determine instantly where actually fish is in relations to your boat, making it much simpler to place baits which more than often result in a bite. SI sonars are known and sought after for its ability to cover a rather extensive range of water, not only the portion of water that comes under the boat. This means that manyfish may be missed when using traditional sonar, as a result of placing it outside the radius. But with the aid of the Side Imaging technology, reaching quite far out will be an easy task, and off-radius fish will be detected correctly. 180 degrees on all sides, against 20 to 60 degrees of former models is like outnumbering a-hundred-to-one. A side imaging fish finder allows you to differentiate rather impeccably between a fish and a structure. For instance, using traditional sonar imaging, the branches of a sunken tree might appear as a fish and return to be elusive to you. But using the SI model, clear pictures of where the tree branches really are will be displayed, putting you in the know as to where fishes are and are not hidden. Actually, the proper keyword is ease of accuracy. Side imaging models are known to contain an operator-friendly point-and-click feature which lets you mark the location and related statistical calculation of those underwater object that peak your interest. This is in case you have the intention of coming back to them later. 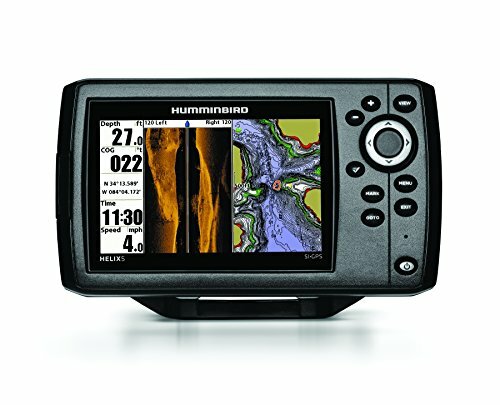 A good number of anglers who are interested in adding a depth/fish finder to their arsenal of tools have the tendency to give in to frustration and confusion with the wide range of options that they will have to select from, not mentioning the distinct features possessed by each of the products. This is rather unfortunate as one fishfinder differs significantly from the other. Therefore, it is crucial that you opt for the most reliable equipment for your needs and circumstances if deriving the optimum benefits possible is your key desire. That said, what is particularly confusing as an aspect of fish finders, is that many anglers tend to struggle in understanding the direction in which each product emits it sonar waves. What is worthy of knowing here is the fact that down-imaging depth finders feature transducers that directs sonar waves down beneath boats, while side-imaging models direct their beams to the sides of the boat. Inherently, both types are fantastic options, with their pros and cons. Therefore, both technologies allow you to detect and catch more fish. As a matter of fact,there are some units that rely on both types of imaging and allow you to opt between the two. Accordingly, it is vital to know the possible circumstances that favor the use of side-imaging technology and when down-imaging obtains impressive results. This technology comes in handy when you are examining a particular area of structure. On a normal 2D Sonar, any large object will only show up as a color-blob, varying in color, dependent on its softness or hardness. But with down imaging, there will be nothing stopping you from seeing exactly what it is, be it a tree, rock, sunken boat or an underwater ridge, just to name a few. Down-imaging sonars are also relatively cheaper than its side-imaging counterparts. If deep waters are your choice of fishing area, then down-imaging stands the best chance at doing the better job for you. Since you will be finding fish vertically rather than horizontally, down-imaging will aid you because the fish finder is suited for these kinds of situations. In this light as well, they will continue to produce you reasonable and relatable images, even while you are boat-traveling on high speed. Side-scan imaging works better when you are slow on the water-slide. On the downside, these fish finders are built to rely on just one transducer, like this, providing less information on the display. Therefore, there will be a production of lower-resolved images. Also, these fish finders often fail to provide much horizontal information. For instance, you might be able to determine that a large fish lurks somewhere below your boat at about 12 feet of depth. But you will not be able to tell what side of the lake the fish is on, as it may be 50 yards to your left, a 100 to your right, or anywhere in-between. The technology embedded in side-scans is very powerful. Due to the fact that the transducer shoots out sound waves on both sides of a boat, it covers a more extensive range of water than you would with the down imaging model. Some up-and-down runs on the lake, and you will have an entire area mapped out, letting you know where structure and how the contour way at the bottom is. Being that 3D sonar, which is another nomenclature for down imaging and side imaging, shines well when used to fish around covers and structure, side imaging provides the best view possible. In other words, with side imaging you get more accurate results. On the other hand, with DI you will not be able to know which tree is where, since the image it gives is flat. With a side-scan, you will be more than able to see if certain trees are on the left, and which of them are on the right. Side imaging gives you a better picture of the marine environment, more than the down imaging counterpart. They offer much better point-of-view than the other sonar imaging does. For instance, when you are using down-imaging depth finder,images that show left-and-right piles of rocks around your boat will show up as a single patch of rocks. But side-imaging fish finders are well-designed to display the rocks as being in distinct groups on either side of your boat. 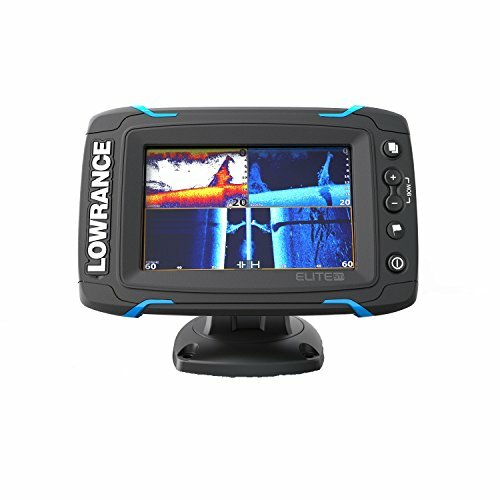 This makes them particularly suitable for finding fish behind shallow creeks and bays, where their orientation provides a better display than the down-imaging scanners do. More often than not, anglers with both types of imaging systems are in the habit of switching to their side-imaging finder when they enter shallower waters. On the downside, they are more expensive than the down-imaging counterpart. They may be an additional expense, but they are definitely worth it. 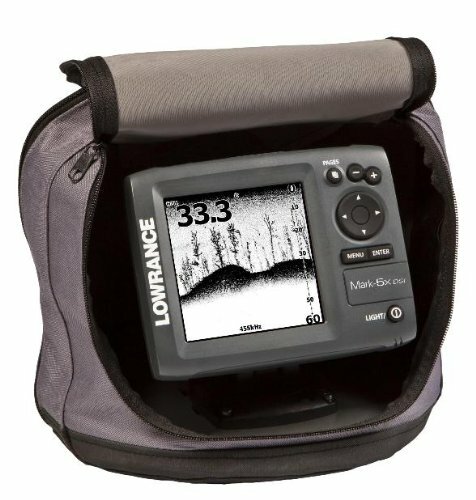 These fish finders also are not built to provide a defined image of things below your boat, probably leaving you in the wanting of a down-imaging model if you are downright interested in learning of what specific piece of cover that lays beneath your boat. Also, as have been said earlier, side-imaging depth finders only work with slower-speeding boats, making it hard to use when you are trying to reach some other potential ice fishing locale. This is, nevertheless, made up for by its ability to cover more water at a given point in time, all accolades to the greater amount of water they scan. Both of the imaging technologies excel in different ways. Therefore, it is crucial that you pick a model that fits your fishing needs in order to maximize your fishing experience. What you need to consider is the depth you will be fishing and the speed at which you are most likely to travel around the boat before finally coming to a decision. Other factors will be the size of the fish you will be in pursuit of and the typical cover on which you will fish. Side viewing sonars are found in almost every brand and size of fish finders in the market. However, a lot of people who buy this model of depth finders do not really know how they work or how to operate a side scan fish finder. Therefore, this side-imaging tutorials set to change that. It hardly matters if it is Side Imaging, Down Scan Imagin or Vu, the rudimentary are similar, and this guide will help you master the use of the fish finder you bought. With any fish finder, installation is key in order to avoid unnecessary confusion and frustration. Getting the proper basics right will put you on your way to an awesome fishing experience. The first thing to consider is transducer placement. With this, there are several mounting options available, and all of them will work. That said, you can opt using the hardware that came with your unit or purchases aftermarket mounts for alternate placements. Your transducer needs to have a completely clear view from side-to-side. You can mount your transducer on the transom by drilling holes in your aluminum or fiberglass hull to mount its brackets. You can also mount it on the side of the jackplate, where you will have to drill a few holes through the plate. It can as well be mounted under the jackplate, under the step or with the trolling motor method. After installing your transducer, clean-wire it to ensure that you get a clean, strong power to your unit, helping it with a clean, noise-free performance. There is a tendency to start fiddling with the sensitivity and contrast as soon as you get on the water, but everything is best left at default until you have the time at the wheel below your belt. Drive past visible objects such as bridge pilings, rocks, boat ramps and grass beds just to begin learning what the beneath-the-surface objects look like in the side view. Preferably, run side imaging while at speeds between 3-6 mph for the best results. Also set the range to 75-100 feet, to begin with, so that you get good information to study for your initial scans. Once you grab what you see on display, begin to experiment with the settings controls. The sensitivity and contrast help you adjust the brightness ratios between light and dark colors. Speed, which is the scroll speed of the side images, should be left at a default speed of 5 when idling between 3 and five mph. You can then do an up-or-down adjustment to match the speed of your boat. Then there is the range which sets the distance of each side, the contour mode which removes the water column from the side image display and does well to stitch the left-and-right image together for a more realistic and aerial-style depiction of the bottom. Left side/right side is used display just the left or right-side picture in the available screen-space. When you find objects at the bottom of the structure, with fish and bait around it, make some recordings in both 455 and 800 kHz, as it will let you replay the information and analyze your findings the minute you are done fishing for the day. The more time you spend making these recordings around areas where you have had catches, the faster you will master the technology to find fish in both familiar and strange water bodies. Remember to experiment with the sensitivity, contrast, sharpness, and speed. The sensitivity should not be too high, or the images will get washed out or too low. It’s best to leave it default until you can make some recordings and experiment with a variety of combos. For contrast, the higher it is, the higher the colors, and when too high, detail will be washed out. On the other hand, too-low contrasts practically dims everything out. Sharpness helps you enhance objects’ edges, making them stand out and more detailed. Increased sharpness equals grainier images, which can be useful for revealing hugging-at-the-bottom fishes. Finally, your scroll speed should be kept even, as slower paces result in blurry images while the faster ones produce poor images as a result of the sonar not being refreshed on your screen. SI being used at the trolling motor will mean reducing it all the way down to 1 or 2 because of the slow movement. 360 imaging over SI at the bow is recommended. Do well to utilize your range function, and experiment with color palettes. Anglers will more than testify that fish finders are a blessing to the vocation. More often than not, in general, anglers would opt for the brilliant Side-scan Imaging technology and many of the fisfinders on the market include an SI and DI combo. However, the SI imaging devices are a better option if you are looking for a device that delivers catchy results.